Today the Hubby and I are celebrating our 15th wedding anniversary. We went in together on an anniversary gift a couple of weeks back, but I wanted to do something to surprise him anyway. Can I just tell you how hard it is to surprise your husband when he is still home recuperating from his accident? So a couple of days ago, I called and ordered 15 helium balloons. (1 for each year we've been married.) Luckily, he had a physical therapy appointment this morning. So I dropped him off and while he was there, the little boys and I went and picked up the balloons. A little side note here: when you are carrying around 15 helium balloons everyone you see smiles. I mean really, everyone. Balloons are just magic like that. Last night I stayed up late after the hubby went to bed and printed out 15 photos from our wedding and engagement. Then I wrote one reason why I love him on the back of each photo. When I got the balloons home today, I tied one note on each balloon and left them in our bedroom for him to find when he got back from his appointment. I pulled it off...he was really surprised. And he loved it, that old softy. Then the hubby and I headed off for a lunch date to the Cheesecake Factory (mmmmm good! I highly recommend the avocado egg rolls...oh yeah!) where we ran into one of my fabulous readers who stopped to introduce herself - hi Emily! That was fun. And a lunch date was quite the luxury. We enjoyed some kiddo-free conversation and alone time which made the whole day special, mainly because it doesn't happen very often. Happy Anniversary Babe! Here's to many more!! WOW what a fantastic idea. Loved reading this post. Hope the rest of your day was special. Those balloons even cheered me up today. What a beautiful and meaningful idea. Happy anniversary. Thanks for sharing. Awww - that is so sweet! What a great idea Wendy! Happy anniversary to you and your hubby....and wishing you many more happy years together! i love love love this idea! hmmm may have to get some red and pink balloons for vday! How wonderful this looks. So So Sweet.. Happy Anniversary ! What a sweet idea!! I love it. Balloons are great. I always like to buy my husband balloons for special occassions, and he always loves it. This is just great. What a sweet idea! Happy anniversary! Sounds like a wonderful day together! Happy Anniversary! This is one of the most romantic things I have ever seen. Happy Anniversary. Congratulations! What a sweet memory you made! Happy Anniversary! What a great idea! I love Cheesecake Factory, too! that is sooo sweet! i love the idea! what a nice surprise for your husband. That's such a terrific idea. So creative. What a great idea! I LOVE IT. Happy Anniversary! Great idea! Happy Anniversary and many, many more years together! I MUST write this idea down somewhere. PERFECT! This just made me cry!!!! I love it! Your celebration is so touching and I'm sure the photos will bring a smile to your hubby's face for a long time to come. That is so utterly sweet, it kind of took my breath away. I'm not gonna lie, I teared up a hair. And I totally second the avocado rolls! soo yummy! that and their beet platter. om nom nom nom! This is so sweet, really. After that many years and four kids, you go girl, keeping it alive :) I love to see people appreciating each other. He must have loved it. Happy Anniversary Wendy! I love the balloon idea!! So sweet :) Happy Anniversary! Happy Anniversary!!!!!! That was such a great idea. I am celebrating my 10th anniversary this year and may just use this for my hubby. SUCH a great idea!!! Love it! Congratulations! I know this anniversary is particularly meaningful after the past few months you've had! 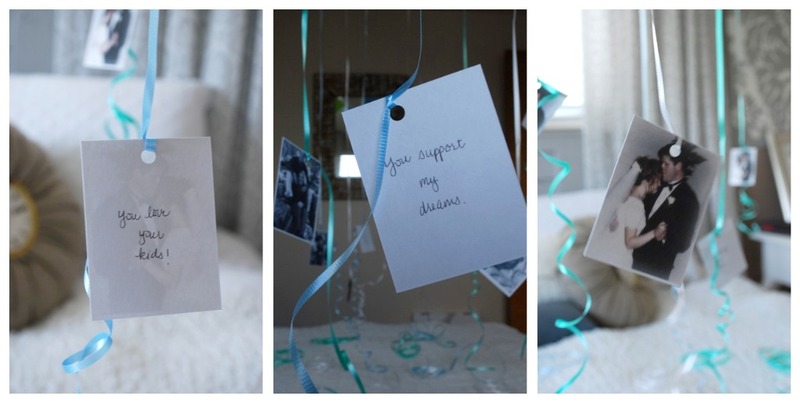 And great idea with the balloons and pix... clever and personal! I love that idea! It's simple, but romantic and with so much sentiment. This would be a great Valentine's surprise, too! that is an amazing idea! I'm certainly going to have to remember this one! LOVE this idea! Fun, sweet & meaningful. Thanks for sharing. Happy Anniversary! This is so sweet! Love the pics hanging from those balloons! Happy anniversary! I have always wanted a million balloons all up at the ceiling. Sigh. I did something similar for my husband when we were dating and we hit our 1 yr together mark. I tied little notes on 12 roses and had them lead him about the house. What an amazingly sweet gesture, lucky guy. Happy anniversary! Happy, happy anniversary. Loved your idea -- so sweet, sentimental and romantic! Happy 15th! What a wonderful idea. Wow, you are one sweet, thoughtful wife. How precious your idea! And love that everyone smiled at you! Congratulations. We celebrated our 35th. last year. Can you imagine 35 balloons or 50 or 75 even. What a wonderful idea; it brought a tear to my eye. I would love to try it, but don't think I could get 39 balloons in my car. Maybe I will try it for V-day, though with less balloons. Hope you have many more wonderful anniversaries. What a wonderful idea! Thank you for sharing this--I'm tucking this into my "worth remembering" files. And congratulations on 15 years together! We celebrated our 25th last summer, and it seems like our 15th was such a short time ago! Anniversaries are worth celebrating, that's for sure! Congrats!! Such a lovely idea! This is the cutest idea I have ever seen!!! I loveee it! Happy Anniversary! Happy 15th Anniversary! Can I just say this is one of the sweetest gestures I have ever heard and two, thanks so much for sharing! You are right, there is something completely magical about balloons. Love it! Beautiful!!!!! Congrats on 15 years! Happy Anniversary! What a fabulous idea! I want to do it in our guest bedroom (in a part of the house we never go in, so it might just work!) for Valentine's. Thanks for the idea! Love your blog, btw! How wonderful! Thank you for sharing your ideas. My husband and I will celebrate 15 years this coming June and I would LOVE to surprise him like this. Oh my God...that is such an awesome post. I love the balloons, the pics its all so romantic. Not to mention I (heart) your bedroom color scheme! Im in the middle of transition from blue/white to grey/white myself. I definately want to do this for our anniversary this month (we met in January and we celebrate our 1st date every year). So awesome...congrats to you and your hubby and many years of wonderful times. What a sweet anniversary surprise! I love your bedroom too, by the way. I love those curtains - they're exactly what I want! Oh, Oh, Oh, can I please steal this idea?!?!?! My 15th anniversary is in May and this sounds like a perfect idea, if I'm someplace that I can get the balloons. Hmmm... the only problem living in the middle of nowhere sometimes! Happy Anniversary! I love your idea and I hope it is borrowable. What an amazing idea. Happy Anniversary! This is definitely being saved in the Decor folder of my favorites for Wedding Ideas! Happy Anniversary! What an adorable idea! My 1st anniversary is coming up... any ideas?? PS I love the avacado egg rolls too! Love this! Thanks for sharing! Happy Anniversary! Made me well up- such a loving gesture.He sure is lucky to have somone who lves him that much.And what a cute idea with the balloons!! That is so adorable and thoughtful! Happy anniversary! What a sweet wife you are. I am so stealing your idea. And I agree...the avocado rolls are amazing! I love this idea! I will be borrowing it for our anniversary! So creative! Love, Love, LOVE the balloon idea. Now I just wish our anniversary wasn't so far away (July). I might have to steal your idea for a 'just because' for my husband. Thanks for sharing - and Happy Anniversary! Oh, I adore your bedroom. I just found your blog today. I am following for sure :) I think I am going to use this idea for Valentine's Day.